The most common question I get when it comes to Back to Eden gardening is where to find wood chips. I thought I would put together a short post explaining what I’ve done over the past several years working with this style of gardening. If you have never heard of Back to Eden gardening, it comes from a documentary produced by Dana Richardson and Sara Zentz about the gardening methods of Paul Gautschi. I’ve written about it before here and here. Where to Find Wood Chips? If you ask Paul Gautschi this question, he will tell you to pray. Everything about Back to Eden gardening points back to God. And that starts with knowing God and seeking him for your provision. I always pray, like Paul suggests, and the Lord always provides more than I need. We can’t disconnect God from the process. In nature, we see God providing an abundance of food all the time. But when we disconnect from God and try to do things our own way, we end up “working hard to fail” as Paul puts it. This would be the same with the Back to Eden methods. If we’re just focused on the techniques and not reconnecting with God, we’re missing the whole point. All those road crews and linemen have to put their tree trimmings somewhere and chances are if you live in a rural location, your county landfill will have an inexhaustible supply of woodchips free for the taking. The main benefit of finding a huge mountain of woodchips (like the one pictured above), is that you can obtain partially-composted wood chips because they have been sitting in one place for a long time. This means the chips will be much finer, in the process of turning in to pure compost, and loaded with nutrients for your garden. It’s as the wood chips break down into soil that nitrogen and other nutrients are released into your garden. So the further along in the process the wood chips are when you get them, the faster you’ll see results in your own garden. If you live in an urban locale, and your county does not provide free wood chips at the landfill, try calling around some of the neighboring counties, particularly rural ones. You might find a goldmine of free wood chips just one county away. Many cities now host compost sites for yard debris. City-dwellers can pick up free compost for their gardens during Spring and Summer months. Sometimes these sites will supply wood chips, also free. However, I’ve found that the wood chips usually do not last long so check frequently. I’ve left my contact info with the supervisor before and asked them to call me when wood chips arrive. And they did. The drawback to compost sites is that the wood chips are almost always fresh-cut which means it will take longer to compost and start providing nutrients to your garden. Tree-care companies will often maintain their own stash of wood chips. But unless you have an in with the owners, they will not be free. But they will probably be very cheap. In the past I’ve paid $20 per cubic yard, which will cover about 80 sq ft of garden. Again, like the compost site, the wood chips may not be composted or might not be the best size. When I’ve purchased from tree-care companies in the past I’ve noticed the chips tend to be a lot bigger than ideal. Something I’ve never done but always considered is chipping my own. We have a few acres of woods and there is plenty to chip. I also like the idea of having more control over how much and when. But its a time-consuming process and it takes an incredible volume of wood to create a cover mulch, not to mention the expense of purchasing and maintaining equipment. Up to this point I’ve been able to find what I needed through the above options. One thing I do not recommend is buying mulch at the store. It may be treated with anti-fungal chemicals to prevent decomposition and colored with dyes. Remember, most store-bought mulch is for aesthetics not gardening. It’s also way too expensive. 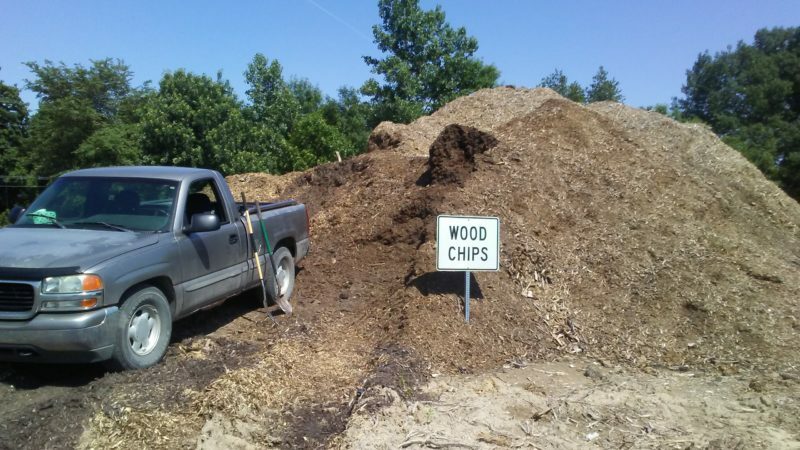 There is something called Chip Drop where you can sign up to have wood chips delivered. The website is https://getchipdrop.com/ – you do have to sign up, etc., but if there are members who operate in your surrounding area, it might be worth a try. I have signed up for Chip Drop in the past but never got any responses. But its free and certain worth a try! We have seasonal termites, how is wood chip composting possible for us? The short answer is yes: people all over the world in all climates use wood chip composting. See a map of gardens here: https://www.backtoedenfilm.com/interactive-map.html. But I’m not sure exactly how to deal with termites, we don’t get them in Minnesota. You’d have to ask someone who lives elsewhere. I have gotten free wood chips from the city but now I have large black ants around my home. How do I solve this problem ? Hi Winnie — sorry to hear about the ant problem. Transporting wood chips or compost will often bring with it insects, usually beneficial. If the ants are in the garden its not really an issue. If they are getting into your home, I’m not an exterminator, but I would just treat with ant control products of your preference and they will typically go away in several days.